If you’re taking part in a walk but don’t want the hassle of carrying a bulky rucksack then this drawstring bag could be what you’re looking for. Allowing you the space to carry the essentials but remaining incredibly light and versatile. 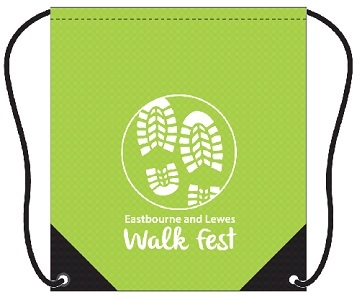 Featuring the Eastbourne & Lewes Walk Fest logo, it doubles up as a fantastic souvenir of time spent touring the beautiful sights of East Sussex.